Here I stand; I can do no other. God help me. Amen (Martin Luther). We are in for an unforgettable experience as we follow the footsteps of a man who changed the course of the world. Not only did Martin Luther’s courage and convictions initiate the Protestant Reformation, but his translation of the Bible into the language of his people impacted German culture, his hymns influenced the development of singing in churches throughout the world, and his cherished union with Katharina von Bora (My Katie is in all things so obliging and pleasing to me that I would not exchange my poverty for the riches of Croesus.) set a model for the practice of clerical marriage. As we pilgrimage through Germany, through the great cities and beautiful countryside of Luther’s world, we will gain a deeper understanding and keener appreciation of his exemplary life, and will come away with a desire to live our own lives more courageously and purposefully. Day 1: Departure from the USA Faith is that which brings the Holy Spirit through the merits of Christ (Martin Luther). Our journey begins with an overnight flight to Berlin, Germany. Day 2: Berlin A mighty fortress is our God (Martin Luther). Welcome to Das Land der Dichter und Denker (the land of poets and thinkers)! After meeting your Faith Journeys Guide, we transfer to our hotel for check-in, dinner and an overnight stay in Berlin. Day 3: Berlin Therefore, it is clear and certain that this faith alone justifies us… Nothing of this article can be yielded or surrendered, even though heaven and earth and everything else falls (Martin Luther). Today’s excursion to Germany’s largest city, Berlin, will do much to help us understand the notion of Zeitgeist, a wonderful German term referring to the general cultural, intellectual, spiritual, and/or political climate or mood of a city or even a nation. We will visit the recently reunited city (after WWII, the victorious powers divided the city into sectors analogous to the occupation zones into which Germany was divided; the sectors of the Western Allies formed West Berlin, while the Soviet sector formed East Berlin). We will see the eastern sector with its famous Unter den Linden Strasse, (an iconic boulevard of linden trees which formerly led directly to the city palace of the Prussian monarchs), the Russian War Memorial, the Brandenburg Gate (a former monumental entry to Unter den Linden and the only remaining gate of a series through which Berlin was once entered), and the German Historical Museum. We will also see what remains of “the Wall” and “Checkpoint Charlie” as we pass into the western sector to experience Kurfurstendamm Strasse, home to some of Berlin’s most luxurious stores. At its eastern end we will see Kaiser Wilhelm Memorial Church, and lastly, we will visit the Olympic Stadium, on a site originally intended for the aborted 1916 Summer Olympics but finally built for the 1936 Summer Olympics. The afternoon will provide ample opportunity to walk, shop and further explore the distinctive character of this unforgettable city before we enjoy dinner and another overnight stay. Day 4: Juterbog & Wittenberg As soon as a coin in the coffer rings/the soul from purgatory springs (attributed to indulgence salesman Johann Tetzel who was purportedly trying to raise money for the ongoing reconstruction of St. Peter’s Basilica. In fact the money went towards helping the Archbishop of Mainz, under whose authority Tetzel was operating, to pay off the debts incurred in securing the agreement of the Pope to his acquisition of the Archbishopric. It is believed that Martin Luther was inspired to write his 95 Theses, in part, due to Tetzel’s actions during this period of time). En route to Wittenberg, which is of such importance in Luther’s life that its official name is Lutherstadt-Wittenberg (Luther City Wittenberg), we’ll lunch in Juterbog to visit the Nikolaikirche (St Nicholas’ Church from the 14th century), remarkable for its three fine aisles and well preserved coffer of Johann Tetzel. Then we continue to Wittenberg, where in 1517, on the doors of All Saints’ Church (also known as the Schlosskirche or “Castle Church” and built 1496–1506) Luther nailed his 95 Theses, sparking the Reformation. The church and doors were seriously damaged by fire in 1760. Still, we’ll see the famous doors (now bronze replacements) which bear the Latin text of the 95 Theses, and the restored burial church of the Reformers. We will also visit City Church (a twin-towered Gothic church in which Luther preached during the Reformation, was married (1525) and baptized his six children), and possibly attend a worship service in English (Saturday’s only), Luther’s well-preserved house where he and his family lived (it contains many Reformation relics, including Luther’s desk, his pulpit, and first editions of his books) and the Renaissance mansion of Philip Melanchton (Luther’s right-hand man), now a museum commemorating his life and containing statues of Luther and Melanchton. We will have much to think about as we gather for dinner and enjoy an overnight stay in Wittenberg. Day 5: Torgau & Leipzig There is no more lovely, friendly and charming relationship, communion or company than a good marriage (Martin Luther, Table Talk, 292). The morning finds us in Torgau, a town on the banks of the Elbe and well known outside of Germany as the place where during the Second World War, the United States forces coming from the west met with forces of the Soviet Union coming from the east. We’ll see in Torgau the early Renaissance Hartenfels castle which dominates the town, its chapel, built in 1544 and consecrated by Martin Luther, and St. Mary’s Church, where Katharina von Bora, Luther’s beloved wife is buried. After lunch we continue to Leipzig where on our own we can see Altes Rathaus, St. Nicholas Church with its undistinguished outward façade but interior soaring Gothic choir and nave (Martin Luther is said to have preached from its ornate 16th-century pulpit), and St. Thomas Church which was originally built as part of a 13th-century monastery and which was heavily restored after World War II. Martin Luther preached here in 1539 heralding the arrival of Protestantism in Leipzig. Bach’s 12 children and the infant Richard Wagner were baptized at St. Thomas Church in the early 17th-century, and both Mozart and Mendelssohn performed here. Bach was choirmaster at this church for 27 years and served in St. Nicholas Church as well. Interesting to note that the remarkable music Bach wrote during his Leipzig years commanded little attention in his lifetime. When he died, he was given a simple grave, without a headstone. We will also visit the Bach Museum before enjoying a leisurely dinner and overnight stay. Day 6: Eisleben Come to me, all of you who weary, and I will give you rest (Luther’s last sermon in St. Andrew’s Church. He finished with the words: “I am able to say many more things about this text, but I feel very weak and sick today. I hope I can do it later.” The following Thursday he died.). Martin Luther was born and died in the small city of Eisleben (Luther had a special affection for this city now officially known as “Luther-City Eisleben” Lutherstadt Eisleben), just a short distance from Leipzig. We’ll savor a guided tour of all the Luther sites in Eisleben including his birth house and death house which are both now well-preserved museums. We’ll also visit the Church of St. Peter and Paul (also known as the Taufkirche or “baptism church”), where Martin Luther was baptized on November 11, 1483. The remains of the original baptismal font whose Latin inscription reads, “Rudera baptistierii, quo tinctus est b. Martinus Lutherus 1483, can still be seen inside the church. We’ll also see the very pulpit from which Luther preached his last sermon in St. Andrew’s Church. In Halle, where in 1508, Luther received his appointment in philosophy, we’ll visit the Bible Institution of Castein, known as the authority for revision of Luther’s Bibles. After a memorable day, we’ll return to Leipzig for dinner and another overnight stay. Day 7: Erfurt Superstition, idolatry, and hypocrisy have ample wages, but truth goes a-begging (Martin Luther, Table Talk, 67). Day 8: Eisenach & Wartburg Castle I fought the Devil with ink (Martin Luther of his experience in Wartburg Castle). 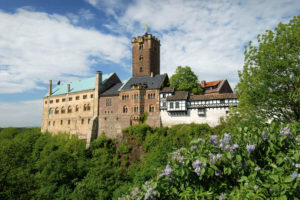 This morning we drive up a steep forested slope to one of the best-preserved medieval castles in Germany, Wartburg Castle, which was founded in 1067 and which looms over the city of Eisenach. It was at Wartburg Castle that Martin Luther, disguised as “Knight George,” translated the New Testament into German. At the castle there is a museum containing mainly Reformation artifacts, including paintings, sculptures, weapons, furniture and tapestries, and the Lutherstube, the room where Luther did the translating and upon whose wall hangs a portrait of him disguised as Junker Jörg (Knight George) by Lucas Cranach. While none of the furnishings are original to Luther’s time, the stove and desk approximate what Luther’s room would have looked like during his 10-month stay, and behind the stove is a hole going through to the bare masonry which is associated with the legend that Luther threw his inkpot at the devil. A private worship service can be organized in the chapel of the Wartburg Castle. Eisenach was home to Martin Luther as a child, and it was also the birthplace of Johann Sebastian Bach. We will visit the Bachhaus, the first worldwide museum to be dedicated to the life and work of Johann Sebastian Bach, and also visit the Lutherhaus, one of the oldest and most picturesque half-timbered buildings remaining in Eisenach and now a museum featuring multimedia exhibits relating Luther’s teachings. We will also explore the Marktplatz with the Georgenkirche (the Church of St. George) where Bach was baptized and where the Gothic baptismal stone still stands. In the afternoon, we continue to Mainz for dinner and an overnight stay. Day 9: Mainz & Worms Know that no one can have indulged in the Holy Writers sufficiently, unless he has governed churches for a hundred years with the prophets, such as Elijah and Elisha, John the Baptist, Christ and the apostles. Do not assail this divine Aeneid; nay, rather revere the ground that it treads. We are beggars: this is true (from Martin Luther’s last statement). In the old part of Mainz, Germany, we will find the Gutenberg Museum, one of the oldest museums of printing in the world with its amazing collections of printing equipment and printed materials from all over the world. It is named after Johann Gutenberg, the inventor of printing from moveable metal type, and located opposite the Cathedral of Mainz, a 1000 year-old Roman Catholic Cathedral, which we will also explore. Afterwards we travel a short distance to Worms, an ancient city whose roots trace back to one of the earliest civilizations in the area. Here Martin Luther arrived under less than desirable circumstances when he was called to appear before the Imperial Diet (“Dee-it”). After refusing to retract his views (with the legendary words, “Here I stand, I can do no other”), Luther was declared an outlaw. Now that Worms is mainly Protestant, a large monument to Luther and other giants of the Reformation has been erected in the city which is a stop along the popular “Luther Trail.” We will see it along with the majestically Romanesque St. Peter’s Cathedral, which for nearly 1000 years, has towered above all the other ancient buildings of the city. We will also visit the Church of the Holy Trinity, with its baroque façade and interior modeled to commemorate the Lutheran Reformation. As we return to Mainz, we have many unforgettable experiences to bring to our farewell dinner and last overnight stay as we attempt to fathom the depth of the dedication exhibited by Martin Luther and other Reformers. Day 10: Frankfurt & Depart for Home We will let the power of the holy places settle over us, along with the profound example and words of Martin Luther; then like other pilgrims of other times, go back to our lives with renewed faith and readiness. We leave our hotel and head for the Frankfurt airport to return to the US.